(SSHE) are designed to overcome process problems encountered when processing viscous fluids. 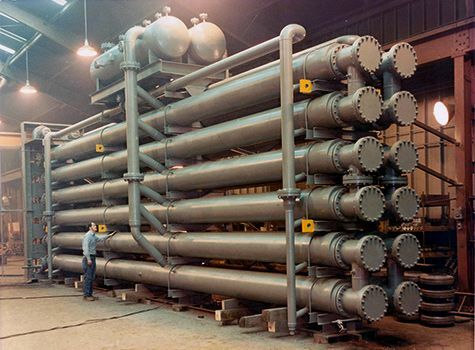 During some processes, shell and tube or plate and frame heat exchangers can foul and need to be taken out of service due to reduced heat transfer capacity. SSHE on the other hand continually scrape the inner wall of the inner pipe, allowing for continuous stable heat transfer by removing the film or crystals from the heat transfer surface. Overall heat transfer is improved by the scraping action. SSHEs incorporate internal mechanisms that remove products from the heat transfer wall. The inner pipe scraped by blades that are attached to an axially central rotating shaft.. Blades may be made from a choice of metals or plastics appropriate to the chemistry of the process fluid.